Dr. Laura S. Anderson, Psy.D. 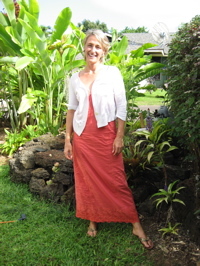 Dr. Anderson is a licensed clinical psychologist who feels very lucky to call Kaua`i home. She has worked in the mental health field for more than twenty years and has been living and working on Kaua`i for more than ten. Dr. Anderson provides treatment for a range of behavioral health needs and specializes in the delivery of services to children, adolescents and their families. Her experience working with children in the school setting has fostered an expertise in addressing school-related behavioral health needs, the treatment of anxiety and depression, management of parenting issues, and the establishment of health family communication patterns. Her services at Seaside Psychology Services include assessment, consultation, and the provision of individual and family therapeutic services. A variety of insurance plans is accepted. Dr. Anderson earned her doctorate degree in psychology at Wright State University from their School of Professional Psychology program. She is a graduate of Williams College, where she received her Bachelor of Arts in Psychology. Her full résumé can be viewed here. Dr. Anderson is committed to being a positive part of the increased health and wellness of our families and communities here on Kaua`i. Dr. Anderson enjoys her work and feels honored to have experience delivering services through multiple agencies and the Department of Education here. In addition to her passion for her work, Dr. Anderson loves parenting and spending time with friends and her ohana here on Kaua`i. She is an avid traveler and a sports and ocean enthusiast. If you'd like healthier patterns in your relationships, less arguing in your home, better behavior from your children, and/or you'd like to see you and your children feel happier about life in general, then Dr. Anderson will be able to work with you to reach these goals. The best way to reach Dr. Anderson is to phone her at  639-1404. You can also contact her by email at drlsanderson@yahoo.com.